Hanoi (VNA) – Vice President Dang Thi Ngoc Thinh has suggested Governor of Japan’s Fukushima prefecture Masao Uchibori encourage local firms to invest in Vietnam, especially in fields of their strength like industry, high-tech agriculture and renewable energy. During a reception in Hanoi on August 24, Thinh thanked the Japanese government and people for providing support for Vietnam, particularly the supply of official development assistance. 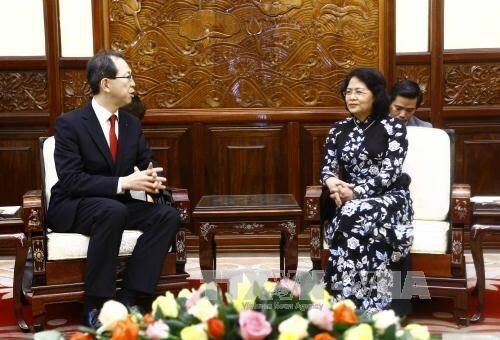 She expressed her wish that Fukushima would create favourable conditions for the Vietnamese nationals in the locality, and promote people-to-people and locality-to-locality exchange, as well as cooperation in culture, tourism, environment, and other fields of strength. Uchibori, for his part, expressed his profound thanks for valuable and sincere support that the Vietnamese people have provided for Fukushima following the nuclear disaster in 2011. He said his visit is meant to strengthen the foundation for bilateral exchange via charter flights and export of Vietnam’s farm produce.